YASA DVD Ripper Platnum can rip DVD Video both video and audio streams of dvd video into various video formats. A large number of video formats are supported including AVI MPEG WMV DivX RM MOV PSP Video iPod Video MPEG-1 MPEG-2 MPEG-4 ASF 3GPP 3GPP2 and so on; Also, YASA DVD Ripper Platnum can rip DVD Video into Audio formats including MP3 MP2 WMA WAV AC3 M4A OGG etc. 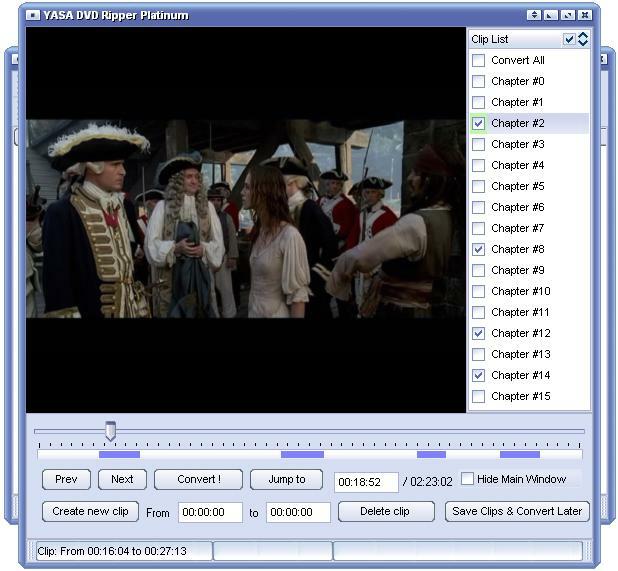 Another useful feature is that YASA DVD Ripper Platnum supports film editing. you can edit and cut the DVD video by specifying the start time and end time. You can use this feature to make the preview of DVD video. An easy-to-use interface allows you to enjoy working with only few clicks(1. choose output videosformats. 2. choose dvd disc. 3. ripping).Whatever you are a veteran or a beginner, you will feel it's developed for you! Qweas is providing links to YASA DVD Ripper Platinum 2.8.29 as a courtesy, and makes no representations regarding YASA DVD Ripper Platinum or any other applications or any information related thereto. Any questions, complaints or claims regarding this application YASA DVD Ripper Platinum 2.8.29 must be directed to the appropriate software vendor. You may click the publisher link of YASA DVD Ripper Platinum on the top of this page to get more details about the vendor.